An ingrown toenail is one of the most commonly treated foot disorders. 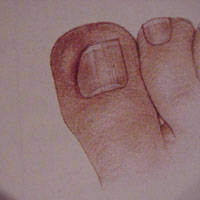 It occurs when the nail becomes embedded in the tissue on one or both sides of the toe. As the condition persists, this tissue becomes inflamed and often infected, while the pain becomes increasingly severe. Sometimes ingrown toenails are the result of improper nail cutting; sometimes by a heavy object falling on the toe; often certain patients are prone to ingrown toenails through heredity. The condition may also result from a deformity caused by a previous fungus infection. The procedure is done in the office, under local anesthesia, with minimal discomfort to the patient. When the toe is fully numb, the ingrown portion of the nail is removed and a chemical is applied to a small portion of the nail root to prevent regrowth. In this way, a permanent correction is made. A laser may be used for this procedure when appropriate. This procedure is called a Matrixectomy. The procedure is so simple that most patients will not even require aspirin afterward. Most normal activities can be resumed immediately. After 24 hours, a foot soak followed by a band-aid will usually be all that is needed. Most patients indicate little or no post-operative discomfort and say that they felt immediate improvement after the procedure was performed. Nail fungus, or onychomycosis (pronounced: on-ee-ko-mi-ho-sis) is an infection of the toenails and is caused by microscopic organisms, similar to those that cause athlete’s foot. These organisms are called fungi. What does nail infected with fungus look like? Nail fungus may cause the nail to become yellow, white, or opaque in color. The texture of the nail also changes and becomes thick and brittle. 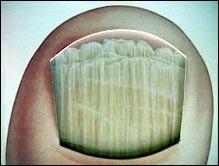 And, if you have had nail fungus for a long time, your nail can even become twisted or distorted. The organisms that cause nail fungus are commonly found all around us… They like darkness, heat, and moisture. That’s why socks, stockings, and shoes create an inviting environment for those organisms. The development of this condition has nothing to do with cleanliness. It is a specific type of an infection-due to a germ called a fungus. Many people who suffer from nail fungus experience some physical pain. However, even when it doesn’t cause physical pain, nail fungus has some emotional effects. It is unsightly and embarrassing. 4. An oral medication (pill) –the two most commonly prescribed drugs are Lamisil and Sporonax tablets. The most effective way to treat nail fungus is with certain new medications that can be taken orally. Because these medications are taken orally, they can attack the fungus from the inside out – something no topical medication can do. And they are more effective than grisofulvin, an older oral medication. Again, there are several newer types of these oral medications now available to treat nail fungus. However it’s important to talk to your doctor about them because some of these medications many negatively interact with other medications you are taking. Please note that fungal conditions also affect the skin of the foot. This is commonly referred to Athlete’s Foot. There are many topical medications available to treat this condition. Examples being Lamisil cream, Spectazole cream, Lotrisone cream, and Oxistat cream. Most of these require a written prescription from your podiatrist.